Do Vegetarians and Vegans Get Enough Protein? A common objection you hear to plant based diets is the inadequate amount of protein you receive. Only animals can provide you with enough of the essential amino acids that are vital to physiological functioning. Or so they say. These perceptions are not true. And in the case of the Standard American Diet, are actually quite harmful. The amount of protein you digest in your diet follows the same rule as all other substances you put in your body: dosage is everything. And too much protein is just as bad as too little. Let’s take the time to go over how much protein you really need, where you can get it from, and the relative dangers (or lack thereof) of getting too little or too much. Proteins are complicated biological molecules that form the building blocks of cells. They’re made up of 20 different amino acids, much in the same way all the words in the english language are made up of 26 different letters. Any living thing will have protein in it, because it has to have protein in order for it to function. This is just as true for algaes and plants as it is for animals. The body naturally synthesizes 11 of the amino acids on its own. The remaining nine are called “essential” amino acids because they must be consumed through the diet. The standard recommendation for protein intake is 0.6g/kg of body weight, as determined by the FAO/WHO. For most people this amounts to 35-55 grams of protein per day. Your body can get by on about 20g/day if it has to. If you eat unprocessed food it’s practically impossible not to get this amount. The latter protein requirements amount to about 100-250 calories/day from protein, which is about 5-10% of your daily caloric intake. 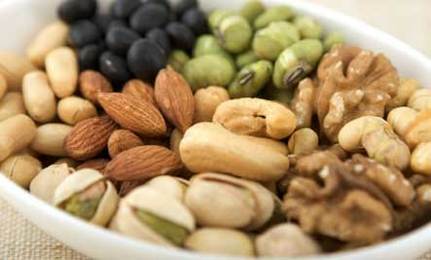 The vast majority of plant foods are about 10%-30% protein by weight. So there you have it. If you eat real food you’ll get enough protein without having to worry about any extra precautions to take. Plants synthesize all 20 amino acids on their own. If you eat lots of plants you’ll therefore get a mix of all 20 of them. The amount of the essential amino acids that you need for daily functioning is fairly small, and it gets progressively smaller with age. Suckling infants need quite a bit more as a percentage of your diet (which is supplied by breast milk). During periods of rapid growth the increased rate of tissue turnover creates a higher need for certain types of amino acids. Naturally this process slows down as you get older. 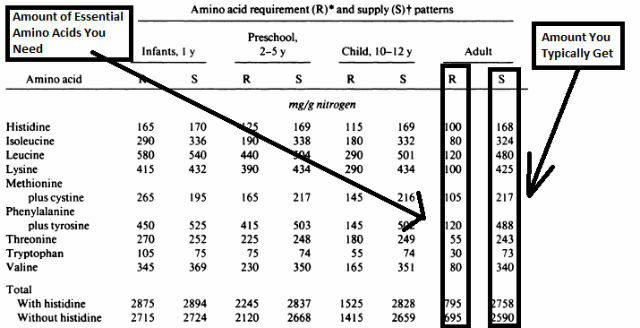 And for adults, the issue is not about not getting enough amino acids…..it’s that they receive far too much! In 1970 the Food and Agricultural Organization did a comprehensive survey of adults on the western diet and monitored their protein intake. The picture below is the comparison between the recommended daily intake of the different essential amino acids compared to how much they actually received. As you can see, with regards to essential amino acids the typical adult receives 400% more protein than they need! Yes Virginia, there is a global protein-mongering conspiracy. But What About Athletes? Don’t They Need More Protein? The issue of protein intake for athletes is a contentious one. However, the general consensus is that endurance athletes should try and consume 1-1.2g/kg of protein, and strength and speed athletes 1.2-1.4g/kg of protein. This amounts to a diet that gets about 12%-15% of its calories from protein. 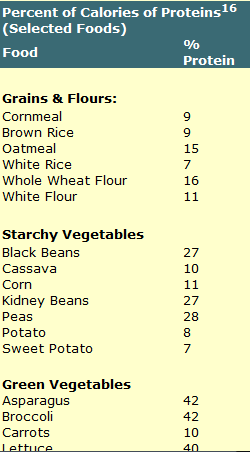 Basic arithmetic will tell you that a hearty diet of greens and legumes will get you very far. What About Complete Proteins? Do You Need To “Mix” Proteins? There is some noise in food marketing about certain foods being a “complete protein”, with the implication that such a distinction has unique advantages for your health. The truth is eating a food that’s a “complete” protein is nice, but hardly consequential in the big scheme of things. To understand why you need to know how protien is digested in the body. After you eat protein it’s cleaved into smaller parts in the stomach and then transported to the intestine and broken down to individual amino acids, which are then transported to different parts of your body to do their thing. Therefore, the body can’t really tell the difference between a “complete” and “incomplete” protein, since all proteins end up being indistinguishable from one another after they’re digested. And we now know that most people get more than enough essential amino acids. So if you add it up the distinction of being a complete protein isn’t all that important. The statistical chance of you having a protein deficiency in the western world are teensy-weensy. Quick, ask yourself: who do I know of that’s suffered from Kwikiorkan? Probably no one. The fuss over getting enough protein is irrational and based on misinformation and false beliefs. However, what’s not discussed nearly as much are the dangers of eating too much protein. Kidney Stones, Gout, and High Blood Pressure, Oh My! Your body doesn’t store excess protein. If you eat more than you need your kidney excretes the majority of the nitrogenous compounds and you piss it away (literally). However, over time excessive protein consumption can lead to “residues” throughout the body that form from undigested components of proteins. Undigested protein metabolites have been linked to kidney stone formation, the prevalence of gout and arthritis, and in some cases higher blood pressure and cholesterol. Curiously enough some of the most egregious side effects from excess protein consumption come from leftover sulfur containing compounds in the kidney. Animal protein has a much higher concentration of sulfur containing amino acids like cysteine and homocysteine, which have a tendency to deposit sulfur residues when consumed in excessive amounts. The dangers from insufficient protein in the diet is a chimera. If you eat real foods then it’s all but impossible not to get your daily recommended amount. Like other foods, protein consumption in the Standard American Diet suffers from a much more common problem: overnutrition. Dr. McDougall does an outstanding job dispelling the protein myth at his website. For more reading I’d recommend reading his teachings on protein in the vegetarian diet. Lemon, Peter. “Effect of Exercise on Protein Requirements.” Journal of Sports Sciences. November 2007, pgs. 53-70. Breslau, Neil, et. al. “Relationship of Animal Protein-Rich Diet to Kidney Stone Formation and Calcium Metabolism.” Journal of Clinical Endocrinology and Metabolism. January, 1988. Choi, Hyon, et. al. “Purine-Rich Foods, Dairy and Protein Intake, and the Risk of Gout in Men” New England Journal of Medicine. March, 2004. Pgs. 1093-1103.